"MATI SYRA ZEMLA" OR "MATKA", FOR SHORT, IS THE SLAVIC GODDESS OF THE EARTH. HER NAME TRANSLATES TO "MOIST MOTHER EARTH", AND DESCRIBES HER AS A FOREVER FERTILE, LIFE-GIVING FORCE. SHE IS NOT SEEN IN HUMAN FORM BUT AS THE EARTH ITSELF...ALTHOUGH IT IS BELIEVED THAT AT CERTAIN TIMES, SHE WILL TAKE HUMAN FORM. AND WHEN SHE DOES, SHE IS USUALLY PORTRAYED WITH BLACK SKIN WHICH ASSOCIATES HER WITH THE BLACKNESS OF THE FERTILE SOIL. 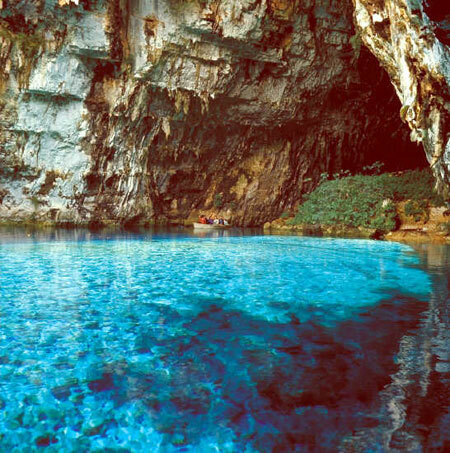 MATKA IS BELIEVED TO BE THE MOST ANCIENT AND POWERFUL OF ALL OF THE EASTERN EUROPEAN DEITIES. IN FACT, MATKA IS SO POWERFUL THAT SHE SURVIVED INTO THE 20TH CENTURY DESPITE ALL ATTEMPTS OF THE CHURCH TO DO AWAY WITH HER. SHE IS THE MOTHER OF ALL--THE PEOPLE, THE ANIMALS, AND ALL OF THE PLANTS OF THE EARTH. 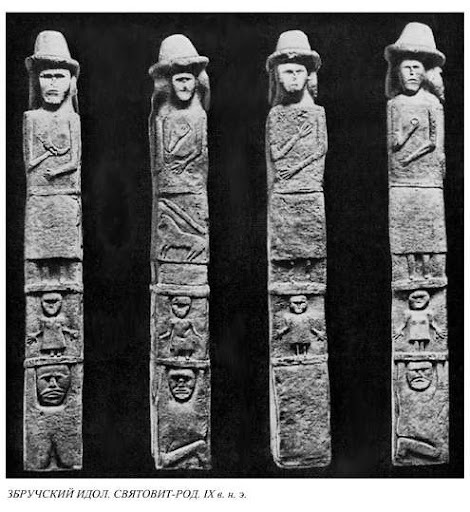 THE SLAVIC PEOPLE HAD A STRONG CONNECTION TO THEIR MOTHER GODDESS AND AN ALTOGETHER DIFFERENT RELATIONSHIP THEY HAD WITH ALL THE OTHER GODS. THEY LOOKED UPON HER WITH A MIXTURE OF LOVE AND ADMIRATION, AND SHE WAS THE ONLY DEITY THEY ADDRESSED PERSONALLY. WHEN THE PEASANT PEOPLE SPOKE OF HER, THEIR EYES WOULD FILL WITH LOVE. THEY CALLED ON HER TO WITNESS PROPERTY DISPUTES AND SWORE BY HER NAME. OATHS AND MARRIAGES WERE CONFIRMED BY SWALLOWING A CLUMP OF EARTH OR HOLDING SOME ON THEIR HEAD WHILE THEY SWEAR AND OATH. HER AID WAS INVOKED DURING EPIDEMICS AND WHILE IN CHILDBIRTH. WHEN THE SLAVS CONVERTED TO CHRISTIANITY, THE CHURCH ATTEMPTED TO TRANSFORM HER CHARACTERISTICS THE VIRGIN MARY, BUT THIS WAS NOT WHOLLY SUCCESSFUL, FOR DURING TRYING TIMES, THE PEOPLE WOULD REVERT TO THE WORSHIP OF MATKA. HER HOLY DAYS ARE MAY 1ST, JUNE 24TH AND AUGUST 1ST. A RITUAL TO HER TOOK PLACE ON THE FIELDS IN AUGUST. AT THIS TIME, A LIBATION OF HEMP OIL WAS POURED OUT ONTO THE FOUR DIRECTIONS...ACCOMPANIED BY A PRAYER FOR PROTECTION AGAINST THE DESTRUCTIVE FORCES OF NATURE. "INARI" IS AN ANCIENT JAPANESE GODDESS OF NOURISHMENT; HER FIRST PLACE OF WORSHIP WAS INARI MOUNTAIN. 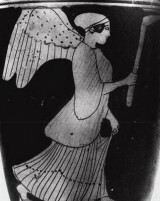 IANARI IS A MYSTERIOUS GODDESS BECAUSE AT DIFFERENT TIMES SHE HAS BEEN DEPICTED AS A MALE AND OTHER TIMES AS A FEMALE. IN FACT, SHE WAS ORIGINALLY GENDERLESS, BUT AS TIME WENT ON, HER FOLLOWERS BEGAN TO ASSOCIATE HER WITH THE FEMALE BECAUSE OF HER STATUS AS A FERTILITY GODDESS, AND LATER, THE BUDDHIST TRADITION MADE HER INTO A MALE DEITY. AS A FEMALE, SHE APPEARS AS A BEAUTIFUL YOUNG WOMAN WITH LONG FLOWING HAIR. SHE IS USUALLY ACCOMPANIED BY A WHITE FOX. SHE USUALLY HOLDS ONE OR MORE OF THE FOLLOWING IN HER HANDS: SHEAF OF RICE, SICKLE, SWORD, OR A JEWEL. SHE IS A MAIDEN IN THE SPRING WITH THE PLANTING OF THE RICE; SUMMER SEES HER AS THE MOTHER NURTURING HER GROWING GRAIN, AND WITH THE HARVEST IN THE FALL, SHE BECOMES THE CRONE. AS A GOD, INARI IS REPRESENTED BY AN OLD MAN WITH A BEARD. INARI IS CONNECTED WITH MANY THINGS. SHE IS THE PROTECTOR OF TRADE, COMMERCE, AND RICE...AS WELL AS A HEALING GODDESS. SHE IS THE "KAMI "OF LUCK AND TRANSFORMATION AND HAS ALSO BEEN KNOWN TO GRANT WISHES AND DESIRES. 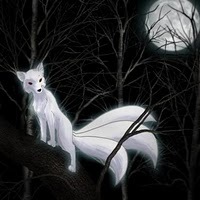 INARI HAS RESPONSIBILITY OVER BOTH REAL AND SPIRIT FOXES, AND IT IS SAID THAT THE WHITE FOX WHO ALWAYS APPEARS WITH HER IS A MESSENGER; INARI HAS ALSO BEEN KNOWN TO SHAPECHANGE INTO A FOX. A SHRINE TO INARI CAN BE FOUND IN MANY JAPANESE TOWNS AND HOUSEHOLDS. NOT ONLY DOES EACH SHRINE HAVE A FOXHOLE, BUT THESE SHRINES ARE ALSO GUARDED BY STATUES OF FOXES...DIVINE MESSENGERS FROM INARI. YAMBE-AKKA is the Sami Goddess of the underworld. She is represented as an old crone, and the trembling of her hands is what causes earthquakes. Yambe-akka shepherds the souls of the dead to the underworld. She is featured in Philip Pullman's "His Dark Materials" series as a Goddess of death of witches, who brings joy along with death. Yambe-akka's name, which means "old woman of the dead," is also seen as YABME-AKKA, JABME-AKKA, JAMEAKKA, JABMEKS, JABMI-AKKO, or JAMI-AJMO-OLLMAJ. 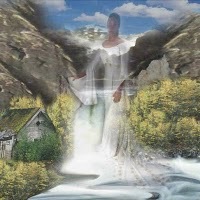 ITUANA is the Brazilian Goddess of the afterworld. She lives at the end of the Milky Way, which is seen as the milk from the breasts of this great mother. Ituana looks after the souls of the dead who have passed into the afterworld, sending them back to earth to be born again. Ituana's name means "mother scorpion." Kartikay, also known as Subhramanya, Kartik or Kartikkeya, is a central deity of the Hindu tradition of India. He is greatly revered by shaivites as a son of Shiva. In Vaishnava, Advaita and Smarta traditions he is held as a manifestation of Brahman. Kartikay is usually known as a god of war in Advaita, Smarta, Vaishnava and Shaiva traditions. His role in Hindu thought is as a bestower of spiritual powers or siddhis, gained through spiritual accomplishments. His role, as bestower of siddhis complements his brother Ganesha's role as Remover of Obstacles. Traditionally Kartikay is the name of the god of war. In the Puranas the deity is identified as Kartikay or Kartikkeya. However in certain myths he is known by six different names to represent the fact that he has six heads. 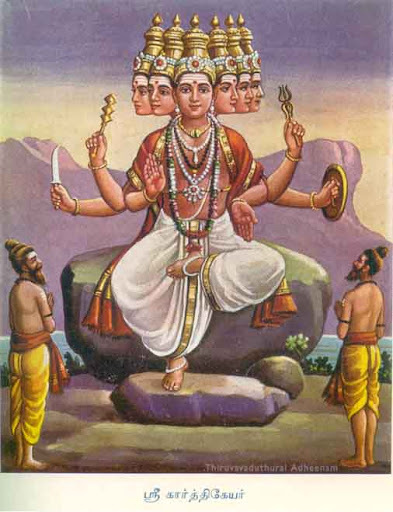 These are: Kartikay, Subramaniam, Skanda, Guha, Shadannana and Sanmukha. 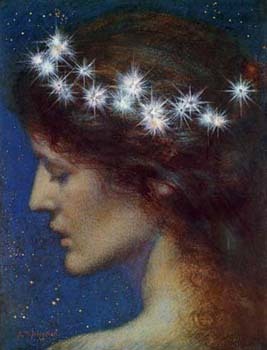 ANANKE (pronounced a-NAN-kee) is the Greek Goddess of necessity. She is one of the first Goddesses, coming into existence at the beginning of time as a snake-like being, entwined with the God Khronos. Ananke and Khronos surrounded the primal egg and divided it into the earth, the heavens, and the seas. Together they created Khaos (Goddess of the air), Aither (God of light), and Erebos (God of darkness). In later mythology, Ananke was said to be the mother of the Moirae (the Fates). * "DROFN (" FOAM FLECK)"
* "BL'oDUGHADDA (THE ONE WITH BLOOD-RED HAIR THE COLOR OF THE WAVES AFTER A NAVAL BATTLE)"
* "BYLGJA (TO BILLOW, OR BIG WAVE)"
* "DUFA (THE PITCHING WAVE)"
* "HEFRING (THE SURGING WAVE)"
* "HIMINGLAEVA (THE WAVE THAT REFLECTS THE LIGHT OF THE SKY, TRANSPARENCY OF WATER)"
* "HRONN (THE WELLING WAVE)"
* "KOLGA (THE COOL WAVE)"
* "UNN (THE FROTHING, WAVE)"
THE SAILORS ARE ALL EAGER TO ESTABLISH A GOOD RAPPORT WITH THESE BEAUTIFUL MAIDENS OF THE OCEANS BECAUSE, IT IS SAID THAT IF THEY SUCCEED, THEY CAN BE ASSURED A SAFE AND UNEVENTFUL VOYAGE WITH THESE POWERFUL GODDESSES PROTECTING AND GUIDING THEM. ON THE OTHER HAND, IF THE SAILORS FAIL TO GAIN THEIR APPROVAL, THEY CAN EXPECT GALE WINDS AND A RAGING TEMPEST THAT WILL MOST LIKELY CAUSE THEIR DEATH AT SEA. AND WHILE IT IS TRUE THAT THESE LOVELY GODDESSES PREFER FUN AND POSITIVE WORKINGS, BE ASSURED THAT THEY WILL NOT HESITATE TO SET UPON THEIR ENEMIES WITH ALL THE FURY THE SEAS CAN POSSESS. THE WAVE MAIDENS ARE THE MOTHERS OF THE GOD, "HEIMDALL," AND THE LOVERS OF "ODIN. 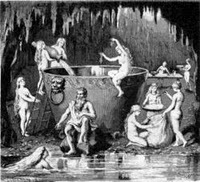 "ACCORDING TO THE TALE, IN THE COURSE OF A WALK ALONG THE SHORELINE, ODIN BEHELD THE NINE BEAUTIFUL WAVE MAIDENS AS THE SLEPT ON THE WHITE SAND. AND HE MARRIED ALL NINE OF THEM AT ONCE. IN TIME, THEY SIMULTANEOUSLY GAVE BIRTH TO HEIMDALL, THE WHITE GOD WHO STOOD GUARD OVER THE ENTRANCE OF THE FORTRESS OF THE GODS. "SOUNDLY ASLEEP ON MIDGARD SANDS"
"THE GUARD OF THE SKY BEHOLDING THEIR PRIDE"
"OH HOW THEY BLIND A TRAVELER'S HEART"
"HEIMDALL BORN WAS HE OF MOTHER'S NINE"
"HEIMDALL SON IS HE OF SISTERS NINE"
"OH HOW THEY BLIND A TRAVELER'S EYE"
"WHAT ELSE DO THEY HAUNT THAN A LONELY MAN'S HEART"
"SIDURI" IS THE BABYLONIAN GODDESS OF IMMORTALITY AND WISDOM. SHE GUARDS THE ENTRANCE TO THE GARDEN OF THE GODS, ENSURING NO MORTALS ENTERS THE FORBIDDEN PARADISE. SHE DISTRIBUTES THE WINE OF IMMORTALITY TO THE DIVINE AND IS ASSOCIATED WITH THE SACRED WATERS OF THE SEA. "YOU SHALL NOT FIND THE LIFE YOU SEEK,"FOR AT THE CREATION OF MANKIND"THE GODS ALLOTTED DEATH TO MEN. "THEY RETAINED LIFE IN THEIR OWN HANDS. "GILGAMESH, LET YOUR BELLY BE FULL,"MAKE YOU MERRY BY DAY AND BY NIGHT. "MAKE EVERYDAY A DAY OF FEASTING AND OF REJOICING"DANCE AND PLAY, BY DAY, BY NIGHT,"LET YOUR CLOTHES BE SPARKLING AND FRESH"WASH YOUR HAIR"BATHE YOUR BODY"ATTEND TO THE BABE WHO HOLDS YOU BY THE HAND"TAKE YOUR WIFE AND LET HER REJOICE IN YOU. "FOR THIS IS THE LOT OF MANKIND TO ENJOY BUT IMMORTAL LIFE IS NOT FOR MEN. FROM THE EPIC OF GILGAMESH, TABLET X"
"AOIFE" (INCREDIBLE BEAUTY) WAS A FIERCE SCOTTISH WARRIOR GODDESS; SHE WAS CALLED THE "PRINCESS OF THE ISLE OF SHADOW". SHE WAS A CELTIC QUEEN ASSOCIATED WITH SCOTLAND. HER RIVAL WAS" SCATHACH" (SOME SAY THEY WERE SISTERS) AND THE TWO OFTEN CLASHED. ACCORDING TO LEGEND, BOTH OPERATED A SCHOOL ON THE ISLE WHERE THEY TRAINED WARRIORS, BUT "AOIFE'S" SCHOOL WAS MUCH LESS SUCCESSFUL. DESPITE CONFLICT BETWEEN SHE AND "CUCHULAIN", THE TWO PRODUCED A SON NAMED "CONLA. " LEGEND HAS IT THAT "CUCHULAIN" LEFT "AOIFE "BEFORE FINDING OUT SHE WAS PREGNANT, AND, WHEN HE WAS LEAVING HER, HE AVE HER LITTLE GOLDEN RING. "AOIFE "RAISED "CONLA "IN SECRET, TRAINING HIM IN THE DARK ARTS AND COMBAT, AND WHEN HE WAS OLD ENOUGH, SHE SENT HIM OUT INTO THE WORLD TO SEEK HIS DESTINY...GIVING HIM THE RING AND TELLING HIM NEVER TO TURN HIS BACK WHILE IN COMBAT. THE LAD FOLLOWED HIS MOTHER'S ADVICE ALTHOUGH IT LED TO HIS DEATH AT THE HANDS OF HIS FATHER WHO WAS UNAWARE THE THE BOY WAS HIS SON. BY THE TIME HE SAW THE RING, IT WAS TOO LATE. OTHER SOURCES PLACE HER AS A CONSORT OF THE SEA GOD "MANANNAN" OR ONE OF HIS SONS, AND SAY SHE STOLE THE" ALPHABET OF KNOWLEDGE" FROM THE DEITIES TO GIVE TO HUMANKIND. FOR THIS TRANSGRESSION, ALONG WITH HER GENERAL MEANNESS, SHE WAS TRANSFORMED INTO A CRANE BY THE ELDER DEITIES. SOME LEGENDS SAY SHE HAUNTS THE COUNTRYSIDE IN THIS FORM TO THIS DAY, OTHERS THAT SHE WAS ACCIDENTALLY KILLED BY HUNTERS. 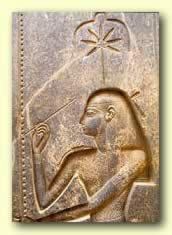 SESHAT is the Egyptian Goddess of writing, measurement, libraries, and archives. She kept the records of the ruling king, tracking the length of their reigns and transcribing their speeches. She was also the "mistress of builders", and assisted with measuring the boundaries of temples and other sacred structures. She is described as either the daughter or wife of Thoth, a moon God who was later credited with inventing writing. 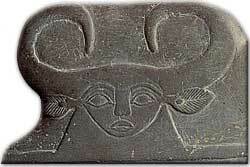 She is depicted in human form with a headdress featuring a seven-pointed star and a set of downward facing horns, which may have originally been a crescent moon. She holds a palm leaf rib on which she records the passing of the years. Another of her names was SAFEKH-AUBI, which means "She Who Wears the Two Horns" and relates to the horns on her headdress. IN MUCH OF ASIA, RICE IS CONSIDERED THE EMBODIMENT OF A BEAUTIFUL WOMAN WHO DISLIKES BEING MAN-HANDLED. MEN ARE PERMITTED TO PREPARE THE LAND, BUT IT IS WOMEN WHO HAVE TO PLANT AND COOK THE RICE. AT HARVEST TIME, THE PREGNANT EARTH MOTHER IS DELIVERED. "DEWI NAWANG SASIH "IS THE RICE GODDESS OF INDONESIA; SHE IS THE GODDESS WHO TAUGHT THE PEOPLE TO COOK RICE. LEGEND HAS IT THAT SHE TAUGHT THE WOMEN TO PUT ONE GRAIN OF RICE IN THE BOILING POT, AND IT WILL SWELL AND THEN DIVIDE AGAIN; THE POT WILL SOON BE FULL OF RICE. HER ONE RESTRICTION WAS THAT 'NO MAN SHOULD TOUCH THE UTENSILS'. THUS, THE PEOPLE OF INDONESIA WERE ABLE TO EAT VERY WELL....UNTIL....A KING WHO THOUGHT THAT HE WAS ABOVE THE LAW INTENTIONALLY TOUCHED A POT. THE GODDESS, IN DISGUST, DEPARTED FROM THE EARTH, AND SINCE THAT TIME IT TAKES A WHOLE BUNCH OF RICE TO FILL A POT BECAUSE, ALTHOUGH THE GRAINS SWELL, THEY NO LONGER DIVIDE AND REPRODUCE. Sventevith, Svetovid, Suvid, Svantevit, Svantovit, Svantov'it, Swantov'it, Sventovit, Zvantevith, 'Swietowit, 'Swiatowid, Sutvid, Vid and, incorrectly, 'Swiatowit, is the Slavic deity of war, fertility and abundance, sometimes referred to as Beli (or Byali) Vid, Beli = white, bright, shining. He always carries his sword (sometimes bow) in one hand, and in the other a drinking horn. Svetovid had a white horse which was kept in his temple and taken care of by priests. It was believed Svantevit rode this horse in battle. The horse was used for divination. Victory in battle, merchant travels and a successful harvest all depended on Svantevit. Many of modern researchers see Svetovid as a Rugian counterpart of the all-Slavic Perun common in Slavic mythology. "FREYA, QUEEN OF THE VALKYRIES"
"COLORS: RED -PHYSICAL LOVE; BLACK-PROTECTION"
"SYMBOLS: CAT, BOAR, FALCON, HORSE, SWORD"
"STONES/METALS--AMBER, EMERALD, JADE, MOONSTONE, COPPER"
"PLANTS-ALDER, BIRCH, ELDER, MINT, ROSE, THYME, FEVERFEW"
Freya is the most beloved of the Nordic Goddesses. She was especially revered by women. They called on her to assist with affairs of the heart. She is the daughter of Njord and the sister of Frey. It is said that She once had a husband named Od, but She somehow lost him and cried golden tears for him. Little is known of him so no one knows how he disappeared. 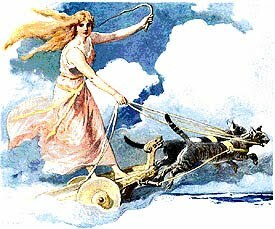 Freya rode on a chariot pulled by two black cats. She sometimes wears a magnificent cloak of falcon feathers as she flies down deep into the Underworld to seek information for her role as seer. And, according to Norse legend, after battles, She and Her warrior maidens would ride helmeted and armed into the battlegrounds to select the most handsome of the fallen warriors to dine with Her in Her banqueting hall. The Norse dwarfs were noted for their fine necklasses made of amber, and Frey was determined to own one, but the only way She could do so was to sleep with each of them. So, although She found them distasteful, She slept Her way to one of the necklasses. Golden ambers are sacred to Her and are sometimes described as the tears she shed when she lost Od. Freya was not only a warrior goddess, but was also revered as a goddess of sexual pleasure and was said to sleep with everyone--gods, mortals, and giants. 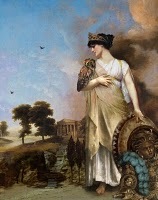 However, She is sometimes viewed as another aspect of Frigg, a beloved wife or spouse, and as a mother. as well as a family and earth goddess. She was mistress of the home crafts and her symbols were the spindle and the distaff. Her sacred animals were the ram, spider and heron. Take time to think about whether you are living your own life to the fullest or whether it has become a routine without imagination for you. Think about Freya's wonderful cape made of falcon feathers and her necklasses of amber. Decide on a piece of clothing or jewelry that speaks of freedom for yourself. Perhaps invite others to a freedom meal and share your emblams with wine and laughter. 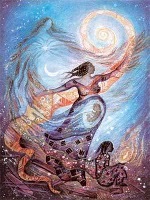 "ASASE YAA" IS THE ASANTE EARTH GODDESS WHO IS RECOGNIZED AS A SOURCE OF TRUTH; HER FOLLOWERS SHOW HER RESPECT WITH A DAY OF REST FROM TILLING THE SOIL ON THURSDAYS. IN FACT, SHE IS A DAILY PART OF LIFE FOR THE GUYANESE WHO STILL PRACTICE THE OLD SPIRITUAL TRADITIONS. BEFORE A FARMER BEGINS TO TILL THE GROUND, HE MUST ASK FOR HER PERMISSION. SHE IS THE OLD WOMAN OF THE EARTH WHO IS PERSONIFIED AS THE MOTHER OF HUMANITY WHO SUPPLIES HER CHILDREN WITH LIFE AND EMBRACES THEM AGAIN AT DEATH. SHE IS PARTNERED WITH THE SKY GOD, "ONYAME". AS THE EARTH MOTHER, SHE IS IN CHARGE OF CONTROLLING THE FERTILITY OF THE SOIL, ENSURING A BOUNTIFUL HARVEST, AND ACTING AS THE WOMB OF THE EARTH. HER SACRED DAY IS THURSDAY. FARMERS SACRIFICED COCKEREL TO ENSURE GOOD HARVEST. SHE IS ALSO GODDESS OF DEAD AND TRUTH. SHE IS NOT A DEITY OF WITH SHRINES OR PRIESTESSES AND OFFERINGS SO THAT SHE MAY HELP THE CROPS TO GROW ARE LEFT ON THE GROUND IN HER HONOR. 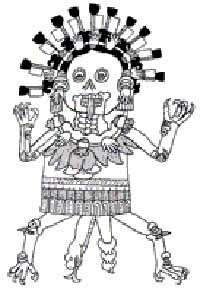 In Mexica mythology the Tzitzimime were once stars but were cast out to become lords of the dark underworld, and were a danger both at night and especially during an eclipse. Each dawn and dusk they would battle the sun. The end of the Azteca fifty-two year cycle a time of even greater anxiety for if the new fire was not successfully drilled, the terrifying Tzitzimime star demons would reassert their control over the world. 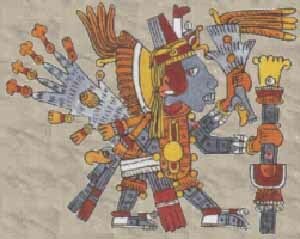 It was prophesized that these star demons would descend to earth and devour the few humans who survived the destruction of the Mexica world and universe when it ended in earthquake and famine. Tech Tags: vegetarian islam sufism sufi spirituality vegan [+] Please visit MysticSaint.Info For full multimedia experience and enjoy special music. 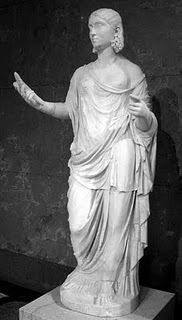 PIETAS (pronounced PIE-eh-tass) is the Roman Goddess of devotion. She represents both devotion to the Gods and to one's own family. 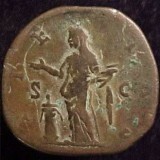 She was often featured on coins, symbolizing both the devotion of the Roman state to its people and of the people to the state. Pietas is usually depicted standing next to an altar fire, with her hands lifted in prayer. In some depictions, she holds a patera (a ritual dish) or a censer. In still others, she either holds a baby or stands with children at her sides. Pietas' name means "duty." 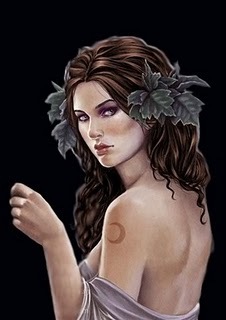 Aradia (Altar of the Goddess) is the Italian Goddess of the Witches. She is the daughter of the Moon Goddess, Diana. According to Charles Leland in his "Aradia: Gospel of Witches", Diana divided Hersey to create the Darkness and the Light (Lucifer). 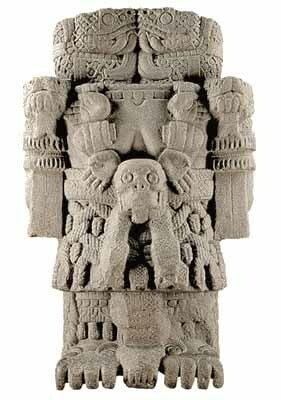 Please note that this is not the Lucifer of Christianity, but a Sun god. She then used magic to charm and seduce Lucifer; this is how Aradia was conceived. Diana, deciding that She liked magic and wanting to develop it, disguised Herself as a mortal woman and went to Earth in order to teach both magic and sorcery. When Diana discovered that the people of the Earth were going through some very hard times, She taught the people magic so they could protect themselves, and eventually, She became so powerful, that She could no longer stay hidden. 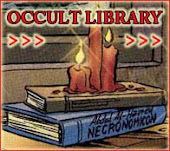 It was for this reason that She taught Aradia all about witchcraft. "WHEN I SHALL HAVE DEPARTED FROM THIS WORLD,"
"WHENEVER YE HAVE NEED OF ANYTHING,"
"ONCE IN THE MONTH, AND WHEN THE MOON IS FULL,"
"YE SHALL ASSEMBLE IN SOME DESERT PLACE,"
"OR IN A FOREST ALL TOGETHER JOIN"
"TO ADORE THE POTENT SPIRIT OF YOUR QUEEN,"
"MY MOTHER, GREAT DIANA, SHE WHO FAIN"
"WOULD LEARN ALL SORCERY YET HAS NOT WON"
"ITS DEEPEST SECRETS, THEN MY MOTHER WILL"
"TEACH HER, IN TRUTH ALL THINGS YET UNKNOWN." "AND YE SHALL BE FREED FROM SLAVERY,"
"AND SO SHALL BE FREE IN EVERYTHING,"
"AND AS THE SIGN THAT YE ARE TRULY FREE,"
"YE SHALL BE NAKED IN YOUR RIGHTS, BOTH MEN"
"AND WOMEN ALSO; THIS SHALL LAST UNTIL"
"THE LAST OF YOUR OPPRESSORS SHALL BE DEAD;"
"AND YE SHALL MAKE THE GAME OF BENEVENTO"
"EXTINGUISHING THE LIGHTS, AND AFTER THAT"
"SHALL HOLD YOUR SUPPER THUS." 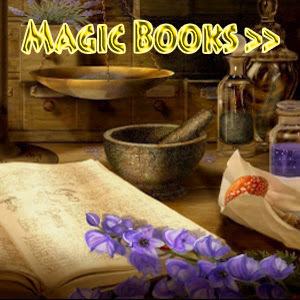 "FROM "THE GOSPEL OF WITCHES" BY CHARLES LELAND"
"TO BLESS A SPECIAL CANDLE FOR SPELLWORK, TAKE A HAND-DIPPED BEESWAX CANDLE APPROPRIATE FOR YOUR PURPOSE. ON THE NIGHT OF THE FULL MOON, WHEN THE MOON IS VISIBLE IN THE SKY, EITHER GO OUTDOORS OR LOOK AT THE MOON THROUGH THE WINDOW. HOLD THE CANDLE IN BOTH HANDS AND PRESENT IT TO THE MOON SAYING:"
"HAIL ARADIA, QUEEN OF LIGHT;"
"STAND I NAKED IN THY SIGHT;"
"MAY THIS CANDLE BLESSED BE;"
The Earth Mother, Ceres, is the Roman name of the Greek Goddess, Demeter. She is the goddess of agriculture. The ancient tale of her stolen daughter (Persephone) helps to explain the cycles of seasonal change. During the period that she was sorrowfully searching for her abducted daughter, she was so stricken with grief, that she struck the Earth barren...the winter months. And once she finds her daughter...and for the six months that her daughter remains with her each year, the Earth is fruitful....the summer and the autumn. There are other cycles which we, as women, experience...the Moon...our biological cycles. 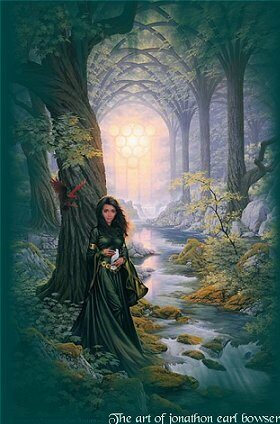 Ceres represents these cycles that we experience ans woman...and allows us to accept the ebbs and flows graciously. Working with Ceres' energy helps one to feel more centered, calm, and connected with the Earth. Are you taking good care of yourself? Take some time out to look after yourself for a change. Make a list of activities that relax you. Indulge in whatever you want to do. We need to allow ourselves some time each day to rest and relax in our own unique way. It may be something like taking a walk in nature or quietly listening to our favorite music...or maybe it is doing nothing at all. Having the courage not to let the demands of others interfere with our special times is being a good friend to ourselves.